It’s often said by the great and good that starting at the bottom and working your way up is key to understanding your industry. ‘It’s all those little jobs that get you to the top as it helps you build the foundation and people’s respect,’ explains Pete Biggs, whose beginnings – as pot washer at his local Beefeater – are as modest as they come. 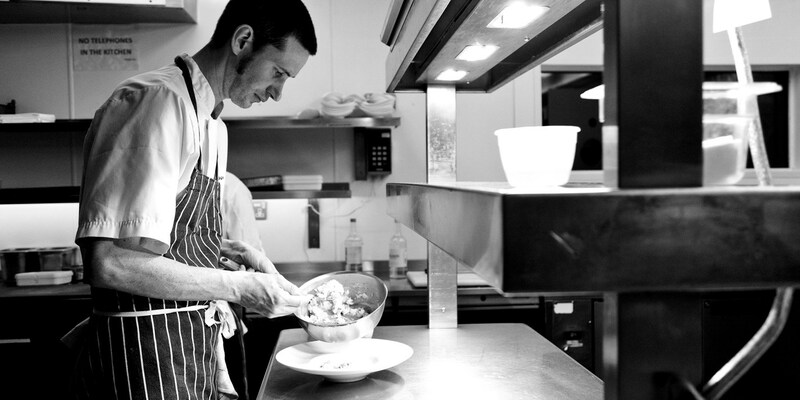 Biggs is mindful of oversized egos in his trade, but to him a humble start maketh the chef. In Outlaw’s opinion their enduring partnership is based on Biggs’ being committed, organised and strong. They are both believers in teamwork. Biggs is respectful of Outlaw’s influence, both as a manager and a creative, and emphasises that his boss didn’t try to turn him into a ‘mini-me’ but gave him room to develop. Outlaw has a measured and considered approach to running a kitchen – qualities that Biggs incorporated when he ran the tastefully-designed dining room at The Capital, an upmarket hotel in Knightsbridge – one of London’s most exclusive postcodes. It’s the place in London to sample Cornish seafood and holds a Michelin star and three AA rosettes. Waitrose’s The Good Food Guide praises the ‘flat-out excellent seafood’ and highlights its Best Set Lunch. Biggs admitted that they had to polish the dishes they serve in London. The hands-on method so appealing to diners in laidback Rock is less well received when patrons have just come from – as Biggs succinctly remarked on TheStaffCanteen.com – ‘shopping in Harrods’. He’s a man who recognised his market and acted accordingly. It’s testament to Biggs that he succeeded in reaching fine-dining status without ripping the heart out of what made the Outlaw methodology so effective. Describing the work that went into his deceptively simple dishes he explains: ‘We might have gone through five stages to make that sauce but on the plate it’s just a sauce.’ Fresh and honest ingredients are refined and presented as delicately balanced plates so exceptional that team Outlaw’s goal to get a reputation ‘for the best seafood and fish in London’ was easily achievable. After making a name for himself in London, Biggs was tasked with the responsibility of looking after Outlaw's next big opening – at the Al Mahara in Dubai. For Biggs, whereas once he was ‘very worried about technique and presentation over flavour’ his onus is now on produce; his food ‘ingredient-based’ rather than led by trends. He’s passionate about seafood, recalling that when he worked in Rock he relished fish so fresh ‘it had just stopped moving, then there it is on the chopping board.’ He maintains ties with local suppliers and captains and still sources the majority of the restaurant’s fish from Cornwall. Not one for signature dishes – preferring a menu that continually reflects the seasons – he is, however, fond of mackerel. Just don’t ask him how he feels about tomato ketchup. Biggs is not one for food heroes, preferring to take an egalitarian approach to cuisine. He respects those who love food. When quizzed on sustainability, he believes that there are plenty of fish in the sea, it’s just that Brits are ‘blinkered in what they eat’ and offers appetising alternatives instead. He worships at the altar of the ‘Three Fs’: food and fish, of course. And football.